MOSCOW, November 15. /TASS/. The Sunday’s elections in the self-proclaimed Donetsk and Lugansk people’s republics have made it possible to avert a crisis in Donbass following the murder of DPR leader Alexander Zakharchenko, Russian Foreign Ministry Spokeswoman Maria Zakharova told a briefing on Thursday. "A real risk of a total destabilization of the situation in the southeast of Ukraine existed in conditions of a possible vacuum of power after the murder of Alexander Zakharchenko," the diplomat said. "Against the backdrop of Kiev-imposed trade and economic blockade and Ukraine leadership’s repeated threats to use force, this could have had a negative effect on the functioning of Donbass and the settlement process in general. Elections helped avert this scenario," she said. 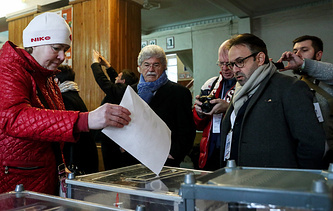 The elections in Donbass were held "in conformity with the main democratic standards" and "were organized within the framework of the universal and equal suffrage". This was confirmed "by numerous observers from more than 20 countries, including countries members of the OSCE," Zakharova stressed. Given all the factors, the results of the elections in Donbass must be respected, she added. The diplomat said the elections had nothing to do with the Minsk agreements, but Russia hoped that the new heads of the self-proclaimed republics would continue cooperating with Kiev within the framework of these agreements. "We expect that within the framework of the Contact Group, the elected representatives of Donetsk and Lugansk will continue a dialogue with Kiev on the settlement of the crisis in Ukraine’s southeast in line with the Minsk agreements," Zakharova stressed. On Sunday, November 11, DPR and LPR voted to elect new heads of the self-proclaimed Donbass republics and members of their unicameral parliaments - People's Councils. Acting LPR head Leonid Pasechnik won 68.3% of votes, and acting DPR head Denis Pushilin - 60.85% of votes. In parliamentary elections, "Mir Luganschine" (Peace to Lugansk Region) movement won 74.13% of votes in LPR, while the "Donetskaya Respublika" (Donetsk Republic) movement received 72.5% of votes in DPR. The voter turnout at the election was rather high. In LPR it reached 77%, and in DPR - 80.1%. Kiev and a number of Western countries have refused to recognize the right of the self-proclaimed Donbass republics to hold elections, saying that this runs counter to the Minsk deal. Lugansk, Donetsk and Moscow have stated on many occasions that holding the elections in Donbass is in the framework of the Minsk agreements, which mention only municipal polls. The decision to hold the elections was taken a week after the death of Alexander Zakharchenko. Zakharchenko, 42, who had been DPR’s Prime Minister since 2014, was killed in an explosion at a restaurant in downtown Donetsk on August 31.